I am trying to do a print and cut for my sons wedding next week! It shows up as navy in the print preview but then prints black.ANY HELP WOULD BE APPRECIATED. I think you will find it is the colour settings on your printer and in MTC are not on the same wavelength. Not sure how you change it but it should be one of two options so that the two types are the same. You're welcome! For anyone curious, I had suggested that the color be lightened in the Custom Color options until the desired lightness was achieved. The colors that come out of my printer are not very close to the colors I see on the screen in MTC. I made color sampler file in MTC and printed it so I have an idea of what I will actually get from a print. I will put it in the gallery titled "color sampler". Thanks, @LaurieB. That's a great idea! The only thing is that Gallery isn't working, the last I read. If you like, I'll host it on my server and post a link. I did find the file in the gallery just now. I tried several times to upload the file here, but that isn't working. 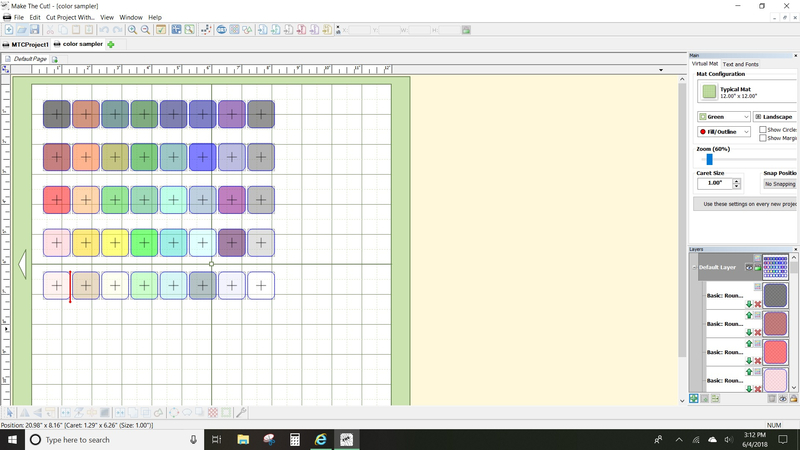 All I really did was make an array of small squares and then colored them with the same order as they appear in the palette in MTC. Thanks! Searching on the word "sampler" brought it right up.